After a decade at Harvard, I left to accept the deanship at the University of Oregon Law School. Five years later, I resigned after the faculty voted that I could not offer the position to an Asian American woman who had been placed third on a long list of candidates after the top two choices turned down the position. I returned to Harvard for five years. Then, in an action that received a great deal of public attention, I took a leave without pay to express my disappointment with the school’s failure to appoint a woman of color to the faculty. When after two years, I refused to return, citing the school’s failure to act on my protest, Harvard dismissed me and forfeited my tenured position. And yet, I am still teaching and writing, now at the New York University School of Law. Leaving jobs and engaging in other activities to protest what I felt was wrong did not destroy my career. To the contrary, those actions, while not always easy to take, enriched my life and provided me with the perhaps unrealistic but no less satisfying sense that I was doing God’s work. Biographical Notes: Derrick Bell was born in 1930, in Pittsburgh, Pennsylvania. in 1952, he earned his bachelor’s degree from Duquesne University, becoming the first in his immediate family to graduate from college (only one member of his extended family had ever completed an undergraduate degree). He then served in Korea as part of the U.S. Airforce. Bell attended law school at the University of Pittsburgh and graduated in 1957. Bell was hired by the U.S. Justice Department after graduation, but left in 1959 over his refusal to terminate his involvement with the NAACP. Thurgood Marshall recruited him to join the NAACP Legal Defense Fund where he oversaw 300 school desegregation cases. In 1966, Bell was named deputy director of civil rights at the U.S. Department of Health, Education and Welfare before becoming a teacher at UCLA‘s Western Center on Law and Poverty in 1968. In 1971, Bell became the first African American to become a tenured professor at Harvard Law School. There, he established a course in civil rights law and wrote Race, Racism and American Law, which today is a standard textbook in law schools around the country. 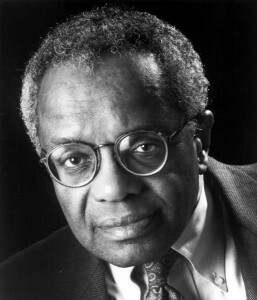 Leaving Harvard, Bell became the first African American dean of the University of Oregon Law School, and in 1985, he resigned in protest after the university directed him not to hire an Asian American candidate for a faculty position. Returning to Harvard Law School, Bell would again resign in protest in 1992 over the school’s failure to hire and offer tenure to minority women. His most recent book, Ethical Ambition: Living a Life of Meaning and Worth, was published in 2002 (Bloomsbury). Faces at the Bottom of the Well is in my all-time Top 10 of books. I truly enjoyed Derrick Bell’s writing style and his imagination as he told stories of race and race relations in a totally unique manner. Randy, thanks for stopping in. I’m glad you enjoyed what you saw, and I look forward to your return. Villager, great minds must think alike (smile), because I love this book, too. Derrick Bell is such a powerful, imginative, and honest writer; and I admire his ability to be a great legal mind as well as a great fiction writer.